Message #1 Posted by Matt Kernal (US) on 19 Aug 2002, 12:43 p.m.
Woohoo Dave! Imagine the BIG surprise I had this morning as I opened today's Oregonian (Portland, OR) newspaper and found a picture of our Dave Hicks sitting in front of an HP9100 along with another picture of an HP 25C and another of an early T.I.M. (Time Is Money) adding machine! The ariticle is titled "The Arithmetic of Love", and is the lead article on the cover of today's Living section. The story tells of Dave's early fascination with HP calculators (at age 13) and of his current collection of around 200-300 calculating devices. 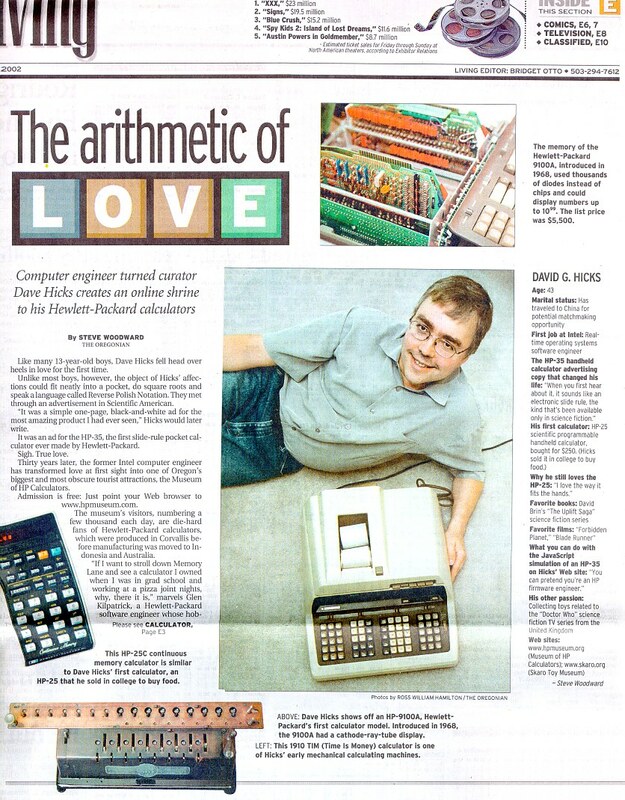 Although the article can only touch the surface of various aspects of Dave's life and hobbies, it does mention calculator collectors (that would be "us") number in the thousands, and that Dave's website is one of Oregon's most visited. Wait-a-go Dave, the Oregonian, and to the rest of us for giving credence to this great hobby! GO TO: http://www.oregonlive.com/oregonian/index.ssf and navigate to the bottom-left corner of the page to access the article. D:\RPL\NEWS\Calculator Hicks' collection includes 200-300 machines.htm , but I didn't see any related pictures. Steve Woodward said it was OK to post this. A BIG 'thank you' for the scan! I also opened my subscription copy of the Oregonian on Monday morning, and was pleasantly surprised to find the article. Several thousand hits a day on the site might not surprise me, what with its reference as a free source of info and pix for eBay auctions. if you still have the copy, would you send it to me?